Initial Coin Offerings – everybody seems to talk about them these days! And there are some good reasons for it. While we have seen an unprecedented growth in cryptoinvestments in late 2017, the ICO wave is now really taking off. Every player in the crypto-scene understands that they need to publish an ICO White Paper in order to communicate their vision to the world. But not all players make the adequate planning and preparation it takes to create an effective and thorough ICO White Paper. They Miss Out Critical Information and Elements. Only 70,85% of ICO White Papers contained a roadmap of the next planned milestones. Only 61,44% of ICO White Papers discussed the technical details of their blockchain implementation. Only 39,11% (!) of ICO White Papers offered a clear value proposition as to why users and investors will profit from using/investing in their venture. Needless to say, this not only leaves (potential) investors in the dark because they don’t find the critical information they are looking for, but it also gives off the impression that the entire ICO is a scam! Think about it: how do you feel reading through an ICO White Paper and then they won’t even tell you the name of the founders? Or they speak of “reputable partners in many industries”, but won’t even name a few? Or you are reading about an interesting project you would like to invest in, but there are no details on the upcoming ICO? What kind of information do they want and need? What reservations or objections might they have? Then go about answering all of these questions and you will have the “raw info” you need in order to craft a professional and effective ICO White Paper. If you want a short-cut, be sure to download my ICO White Paper Study 2017 in which I present a checklist and ideal structure for an ICO White Paper, based on my thorough analysis of more than 500 published ICO White Papers. They Mistake The ICO White Paper for a Technical White Paper. Another bad mistake too many start-ups make is that they only publish a technical white paper. In other words, they leave out all of the business and financial details out of the white paper. They become too product-centric, only want to share and pitch their great technical blockchain implementation (which is important and great! ), but don’t take into account the typical ICO White Paper reader. Look: most ICO White Paper readers are NOT blockchain experts. They are not coders and programmers, but often they are business analysts, financial investors or simply curious and committed crypto-investors who now want to put their Bitcoin and Ethereum coins into projects they believe in. While you should definitely share the technical implementation of your blockchain-based service in solid detail, you also need to consider that an ICO White Paper is more than just a technical white paper. The ICO White Paper is basically both a Business Plan and a Technical White Paper in one. That is why it should encompass such business plan elements as a SWOT-analysis, an overview of your target market, market potential and target audience/ideal customer, as well as features and benefits of your solution, explained in simple terms. Moreover, you need to make sure that you give all the required details of your planned tokensale. This includes, but is not limited to, the type of token you will be using, the start and end date of your ICO, where and how investors can participate, which cryptocurrencies they can use to contribute, how the tokens will be distributed and how the funds will be used. Your goal should be that all prospective readers of your white paper – from business analysts, coders, to curious crypto-investors – can find the information they are looking for. And don’t worry about overloading them with too much information! A well-structured ICO White Paper with a good intro and respective sections will convince every reader that they find the information they need to make a qualified decision about investing in your start-up or venture. Another common mistake I see most start-ups make is that they don’t consider their ICO White Paper as part of a bigger marketing strategy. You see, it is simply not enough to go publish your ICO White Paper on your website and hope that investors and partners will just come along. Given the recent bans on advertising for ICOs announced by Facebook and Google, it’s even harder to get the required exposure and reach for promoting your ICO. Still, there are some great ways in which you can make sure your ICO takes off. A professional and thorough white paper, that contains all the essential information (success secret 1) and presents both a business plan and the technical details of your blockchain implementation (success secret 2) is a great, but only the first step of your ICO Marketing Strategy. The best way to a successful ICO is to partner with an established, experienced and trusted network of industry insiders and ICO veterans that will share with you their expertise, help you in positioning and marketing, consult you on legal aspects and connect you with the right industry leaders and experts. Ideally, they also have their own groups of followers and an established name in their industry, so that partnering with them adds even more credibility to your project and ICO. Best of all is if they are well-connected and present in one of the most interesting and booming ICO markets. If you already wonder where you can get access to such a distinguished group of experts, then I have great news for you. Look no further! Because you can get all this with partnering up with The Strongest Link, Switzerland’s first ICO Accelerator Platform. I personally serve as the person responsible for white paper creation, while my partners will take care of all other elements including business development, legal advice, ICO marketing strategy, raising capital, technical consulting and much much more. 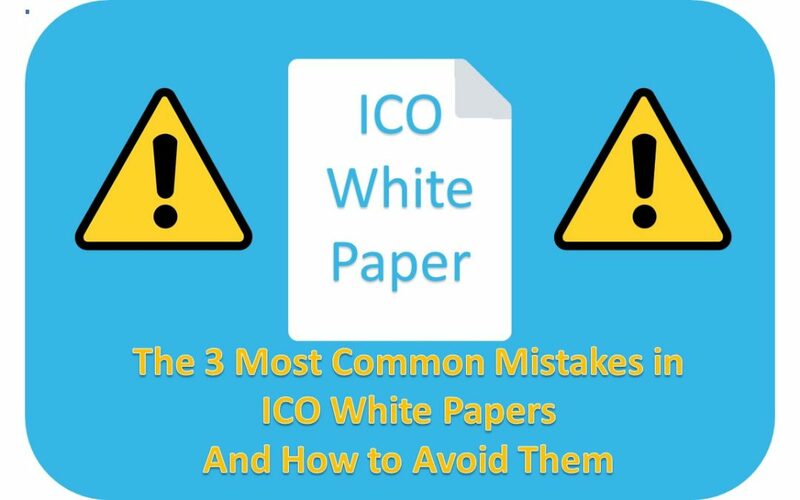 The ICO White Paper is the first and potentially the most important step to ensuring your ICO will actually be successful. You have invested hard time and money to bring your project this far. If you want to raise the required funds you need to promote your business vision, make sure you avoid these 3 common mistakes by implementing the steps discussed. If you want to learn more about Best Practices for ICO White Papers, be sure to download the full report of my analysis by clicking here. And if you want to get your own professional ICO White Paper and access to a powerful partner network with Switzerland’s first ICO Accelerator Platform, be sure to learn more about our ICO White Paper services here.